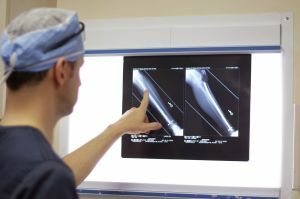 In addition to being one of the top operating orthopedic surgeons in Southern California, Dr. Steven Meier is also a leading expert in orthopedic forensic medicine. As a board-certified orthopedic surgeon with a full-time surgical practice, he has both the scope of knowledge and practical experience to provide expert medical opinions in a variety of cases. These include providing both expert witness testimony in civil litigation involving personal injury and medical malpractice, as well as evaluating workers’ compensation cases. Dr. Meier, a Los Angeles orthopedic surgeon, provides expert reports that are detailed, yet easy to read. He specializes in complex cases involving upper extremity, lower extremity, and spine injuries and provides thorough, accurate reports in a timely manner. To find out more about Dr. Meier’s experience providing forensic services, contact him today at 310.736.2793. Trying to determine what really happened in an injury case? Need to know if and how an injury is causally related to an alleged incident, how it affected the claimant, and/or whether patient care was appropriate and met the standard of care? Dr. Meier is an expert at providing evidence-based determinations on causation using biomechanical analysis where applicable. He understands the conflicts that arise between applicant and defense and addresses each case individually, thoughtfully addressing all of the pertinent issues involved. Dr. Meier has extensive experience in both deposition and trial testimony. He is routinely retained as an expert for both plaintiff and defense counsel. If you are looking for accurate and impartial analysis, contact Dr. Meier today. When it comes to workers’ compensation evaluations, Dr. Meier offers expert opinions in the causation of injury, reasonable and necessary treatment, functional ability and limitations, permanent impairment based on both the 5th edition and 6th edition of the AMA Guides to the Evaluation of Permanent Impairment, apportionment, and future medical care. He is certified as a Qualified Medical Evaluator in the State of California. Dr. Meier’s opinions are stated in terms of reasonable medical probability and based on substantial medical evidence, consistent with applicable labor code and case law. Dr. Meier strives to issue reports which are prompt and comprehensive, helping to reduce case length and facilitate settlement. Contact Dr. Meier’s office today at 310.736.2793 to request a list of California applicant and defense attorneys who have agreed to him as an Agreed Medical Evaluator. For more information about worker’s compensation, visit Medscape.com. Dr. Meier provides disability evaluations for a wide variety of occupations – from professional athletes to manual laborers, to white-collar professionals. Dr. Meier utilizes a number of approaches and techniques to assess an individual’s actual functional ability and to distinguish this from their voluntary functional tolerance. Dr. Meier is an expert in determining whether an individual has the ability to return to their own occupation or any occupation in the open labor market. As a board-certified and fellowship-trained orthopedic surgeon, Dr. Meier is an internationally recognized and highly sought-after expert. He has been named a “Super Doctor” by Los Angeles Magazine and patients often travel from out-of-state and overseas to see him. He is often sought out to evaluate complex conditions, and also by patients who have had adverse results with prior surgery. Despite his active clinical schedule, Dr. Meier also lectures and instructs on orthopedic surgery. He has also developed original surgical techniques and performed orthopedic surgery in countries around the world. Steven W. Meier, M.D. is a fellowship-trained, internationally recognized, Board Certified Los Angeles Orthopedic surgeon with extensive expertise in orthopedics and sports medicine. Although he maintains a busy clinical practice while as a clinician and surgeon, Dr. Steven W. Meier is also actively involved in the medical community as an educator and researcher. He lectures and instructs advanced surgical techniques to other practicing surgeons and has performed surgery all around the world including Europe, South America, Africa and Asia. Dr. Meier has developed several original and innovative surgical techniques and has authored many publications in orthopedic specialty journals and textbooks, both nationally and internationally. Dr. Steven W. Meier is highly regarded within the orthopedic community and is considered to be an expert in the field of orthopedic surgery. Contact Dr. Meier today at 310.736.2793 or fill out his website’s contact form to find out more information. His office is easy to reach, and he returns calls promptly. If you would like a sample report sent to you, please contact Evelyn Cao at ecao@mosm.com. Contact Dr. Meier to obtain an expert evaluation and analysis today.